A while back I posted a review of some computer keyboards and talked about my search for the perfect one. At that time I selected the Unicomp keyboard which is a reproduction of the venerable IBM Model M clicky keyboard (which you can still find on Ebay at good prices). Well, recently I’ve been having hand problems so I thought a change was in order, especially at work. I spent quite a while on various sites including http://geekhack.org/ where all things keyboard/mice are discussed to minute detail. I learned a lot about the various switches used, activation pressures, otaku keyboards (no keys labeled), and best keyboards for gaming and typing. I figured out that the Unicomp keyboard I had at work was really just a typical rubber dome switch board that resembled the clicky Unicomp that I was using at home. I had bought it out of consideration of my fellow workers who might not like to hear the loud keyboard. I switched that out for a MaCally icekey keyboard ($20 at Amazon, good buy) that has scissor switches (like some laptops). That is a temporary fix for work, but wasn’t good enough for home. Besides, I was in this to buy something good and the sudden obsession wasn’t appeased yet. The good news is that there are a lot of good keyboards out there with very good switches. The bad news is that there are few places to try them out before you buy. So I ended up purchasing the TypeMatrix keyboard which is completely different setup with the keys in orderly rows. You know, I thought I would plunge right into the deep end. This is a small keyboard with pretty good key action (scissor switches), but I could not get past the backspace being in the middle. The idea is to rely more on your strong pointer fingers rather than your weak pinkies, but for me the backspace is just too engrained in me to switch. This keyboard went back. After much searching, including looking at all kinds of ergonomic alternatives, I figured out two things. 1. Because so much time is spent with a keyboard it pays to get a good one. and 2. If you want a good one, you will pay. As in probably too much cash unless you go the old IBM route which I would’ve done if I didn’t already have the Unicomp. It’s the Happy Hacking Pro 2 keyboard (not the Lite). 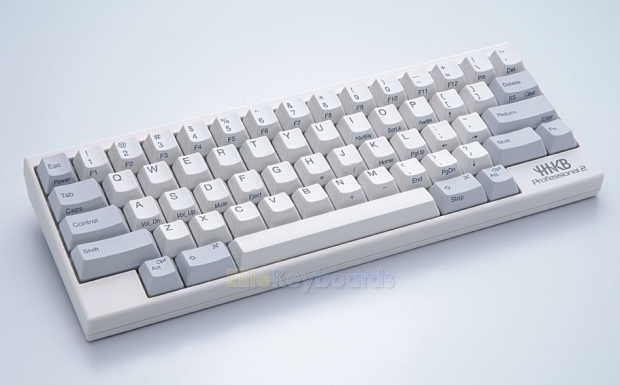 It has expensive topre switches (dome plus spring) and it is tiny — uses a function key to access things like the f-keys and arrows so it is only 60 keys instead of the usual 87 or 104. The key action is just great; light pressure but still great feedback. I’m still getting used to the arrangement of the keys; the backspace is the immediate problem, but I think I will get used to it soon since it is just one key down from where I’m used to having it. I though I would miss the dedicated arrow keys, but I’m finding the Fn key combination to be pretty easy. I’m also loving the small form of this keyboard. Nice to have some real estate back on my desk, and it is small enough to pack with my laptop if I want to do some serious typing on the road (though I have a thinkpad which has a pretty good keyboard). The HHKB has dip switches to change from nominal, to PC, to Mac configurations so it should work on most systems. The keyboard arrangement is particularly good for Linux (I have Ubuntu on my laptop) since the control button is prominent above the shift (used often in Emacs etc.). So for the moment I am happy with this keyboard. The real issue with it is the cost. I got it here: http://elitekeyboards.com/ which seems to be the only place to get it since it is made for the Japanese market (instructions are in Japanese only). Yeah, it is really expensive. But I figured if it helps these old fingers of mine, it will be worth it. Still cheaper than some pots and pans (inside joke). I’ll let you know how it works as I get used to it. I have found the small cherry keybords http://www.overclock.net/t/694551/cherry-g84-4100-review to be very nice. And the TCH-11 trackball http://www.atlantisgadgets.com/index.php?main_page=popup_image&pID=219. Using theses gives me a very small foot print and I don’t seem to suffer much damage to my fingers of wrists. I use the middle button of the mouse alot, so can’t have a wheel mouse because of the added pressure required to press the wheel.